First four terms of this A.P. will be −2, −2, −2 and −2. First four terms of this A.P. will be 4, 1, −2 and −5. Clearly, the series will be 1.25, −1.50, −1.75, −2.00 ……..
First four terms of this A.P. will be −1.25, −1.50, −1.75 and −2.00. i.e., ak+1− ak is not the same every time. Therefore, the given numbers are not forming an A.P. i.e., ak+1− ak is same every time. Therefore, and the given numbers are in A.P. The given numbers are in A.P. i.e., ak+1 − ak is not the same every time. Therefore, the given numbers are not in A.P. Therefore, the given numbers are in A.P. I. a = 7, d = 3, n = 8, an = ? IV. 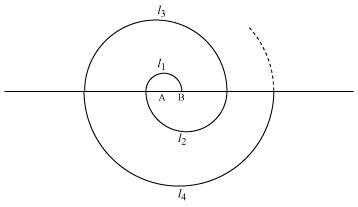 a = −18.9, d = 2.5, an = 3.6, n = ? V. a = 3.5, d = 0, n = 105, an = ? A. 28 B. 22 C. − 38 D.
Hence, the answer is B. Therefore, the missing terms are and 8 respectively. Therefore, −150 is not a term of this A.P. If the 3rd and the 9th terms of an A.P. are 4 and − 8 respectively. Which term of this A.P. is zero. Subba Rao started work in 1995 at an annual salary of Rs 5000 and received an increment of Rs 200 each year. In which year did his income reach Rs 7000? (x)Given that, l = 28, S = 144 and there are total of 9 terms. n cannot be . As the number of terms can neither be negative nor fractional, therefore, n = 12 only. If the sum of the first n terms of an AP is 4n − n2, what is the first term (that is S1)? What is the sum of first two terms? What is the second term? Similarly find the 3rd, the10th and the nth terms. Therefore, the length of such spiral of thirteen consecutive semi-circles will be 143 cm. The distances of potatoes are as follows. It can be observed that these distances are in A.P. As every time she has to run back to the bucket, therefore, the total distance that the competitor has to run will be two times of it. We have to find the first negative term of this A.P. Therefore, 32nd term will be the first negative term of this A.P. It is given that the rungs are 25 cm apart and the top and bottom rungs are m apart. Now, as the lengths of the rungs decrease uniformly, they will be in an A.P. 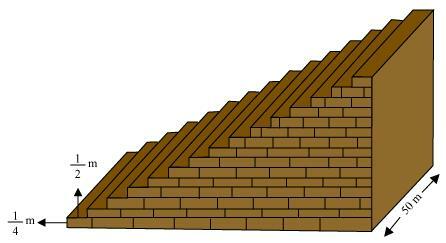 The length of the wood required for the rungs equals the sum of all the terms of this A.P. 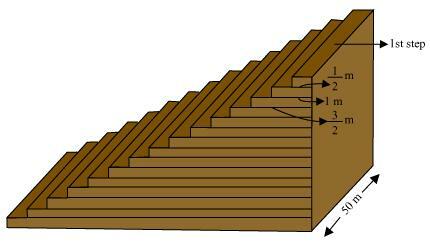 Therefore, the length of the wood required for the rungs is 385 cm. It can be observed that the number of houses are in an A.P. having a as 1 and d also as 1. Let us assume that the number of xth house was like this. Sum of n terms in an A.P. It is given that these sums are equal to each other. However, the house numbers are positive integers. The value of x will be 35 only. Therefore, house number 35 is such that the sum of the numbers of houses preceding the house numbered 35 is equal to the sum of the numbers of the houses following it. 3rd step is m wide. 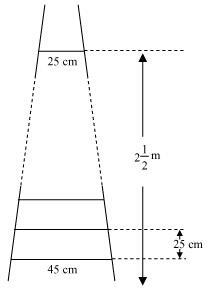 Therefore, the width of each step is increasing by m each time whereas their height m and length 50 m remains the same. It can be observed that the volumes of concrete in these steps are in an A.P. Volume of concrete required to build the terrace is 750 m3.